The former workers at the private trash hauler, which surrendered its license in November, said they and others were owed money from both their last weeks on the job in 2018 and for working off the books for years at a rate of $80 per night. 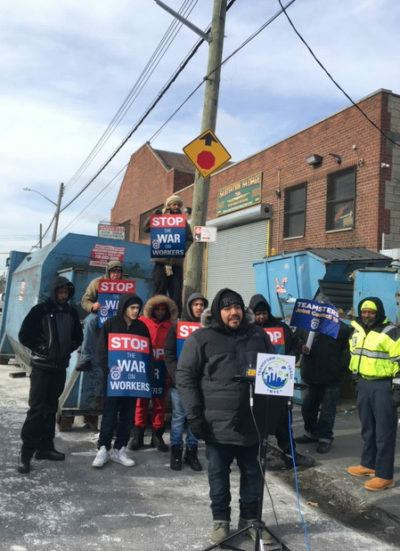 The temperature was barely above zero in the Bronx on Martin Luther King Jr. Day, but more than a dozen former garbage workers showed up outside the offices of Sanitation Salvage, once one of the major private trash haulers in the city. They carried signs and demanded wages they say they are owed by the company, which surrendered its license in November after a series of revelations about its troubled operations. Andres Hernandez said he’d worked as a Sanitation Salvage driver for seven years. Manuel Matias said he’d started working at Sanitation Salvage at age 17 and was paid off the books for years. Alex Amante said the cold was all too familiar — he’d regularly worked the city’s streets at night in such temperatures, doing shifts that he and other workers said could be 18 or even 21 hours long. The former Sanitation Salvage workers picked the day to protest intentionally. When King was assassinated in Memphis, Tennessee, in 1968, he’d come to the city in support of its sanitation workers, who were on strike over low pay and dangerous conditions following the deaths of two workers. “All we want is for them to pay us what they owe us,” Hernandez said. The former Sanitation Salvage workers said they and others were owed money from both their last weeks on the job in 2018 and for working off the books for years at a rate of $80 per night. In 2015, after an investigation, the U.S. Department of Labor concluded that Sanitation Salvage owed workers $385,000 in unpaid overtime accumulated over the previous three years alone, but the company never paid it. In 2018, Sanitation Salvage was the focus of a series of articles by ProPublica exposing its history of safety issues and role in two recent deaths, claims of exploitation by workers, and its cozy relationship with the union representing those workers. The union, long run by a mobster, was seen by many of its ostensible members to be in league with Sanitation Salvage’s owners; in 2013, the National Labor Relations Board found that management unlawfully threatened to fire workers who opposed the union. The BIC eventually declared the company an “an imminent danger to life and property” and suspended its operations. Months later, following the company’s return to business, it surrendered its license for good. 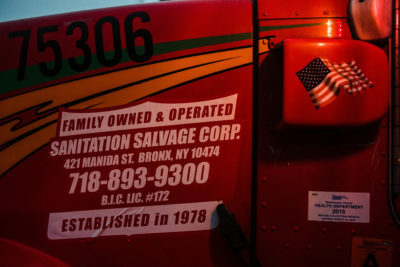 Spokesmen and lawyers for Sanitation Salvage have repeatedly defended the company’s record, arguing it was unfairly run out of the industry by overzealous regulators looking to score political points with safety and labor advocates. The company’s owners and lawyers did not respond to requests for comment on Monday’s rally and the claims of wages owed. The company has previously argued that the U.S. Department of Labor findings from 2015 were without merit. The BIC has long had the power to refer any reports or evidence of wage and labor violations to state and federal authorities. In the months before suspending Sanitation Salvage’s license, the BIC said it had conducted an extensive audit and investigation of the company’s operations. The BIC’s spokeswoman said that the agency had “referred claims of unpaid wages at Sanitation Salvage to an appropriate investigatory body,” but she did not provide further details. The BIC said an earlier audit of the company’s dealings from 2013 to 2015 resulted in the agency fining Sanitation Salvage $85,000 for its failure to properly maintain books and records. A representative from Reynoso’s office said the councilman thinks that the BIC “should already be referring out cases to the relevant enforcement agencies when they find wrongdoing” and that it is critical to codify this step into law. The representative said he was unaware if the BIC had referred claims of unpaid wages and financial irregularities at Sanitation Salvage to the state attorney general. “If not, we would certainly push them to do so, as well as calling on the attorney general to ensure that those wages are recovered,” Asher Freeman, Reynoso’s legislative director, wrote in an email. James, the former New York City public advocate, has long used the consulting firm Hamilton Campaign Network in her campaigns for office. Her campaign paid the firm roughly $2.4 million during her bid for attorney general last year. The head of that firm, John Emrick, is also a registered lobbyist for Sanitation Salvage. 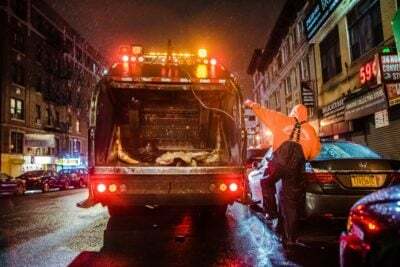 The Bronx hauler has paid Emrick’s lobbying firm, the MirRam Group, more than $120,000 since 2016 to lobby against a variety of pending city measures involving the private waste industry. The spokesperson for James would not comment when asked if Emrick’s roles with the campaign and lobbying firms would present any kind of conflict for James if the issue were referred to her office. Emrick did not immediately respond to a request for comment. ProPublica’s investigation of Sanitation Salvage showed its drivers and helpers often worked punishing shifts of 18 hours or longer, racing to complete routes with 1,000 stops or more. The workers regularly picked up young men on the street to help work shifts, paid off the books and for little money. Mouctar Diallo, 21, was one such worker — what the company called a “third man.” Diallo, a Guinean immigrant, died on the job when he fell off a Sanitation Salvage truck in November 2017. The BIC eventually determined that both the driver and the helper on the truck lied to investigators at the scene when they said they had no idea who Diallo was and instead described him as a homeless man who had inexplicably jumped on the truck. At the rally on Monday, Alexis Robinson said he, too, had been a “third man” and had worked several times with Diallo on a notoriously long nighttime shift that the company called Route 3. John Rojas, another off-the-books worker and Robinson’s cousin, said he began working at Sanitation Salvage after Diallo’s death. Route 3 became his route. “The suicide route, we called it,” Rojas said.